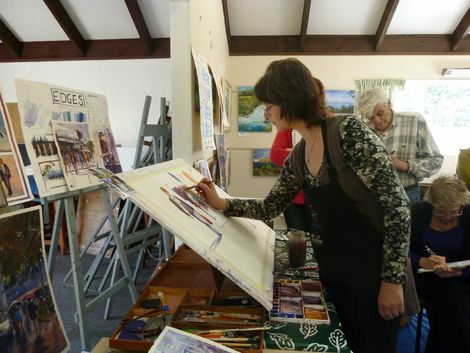 FORTNIGHTLY CLASSES are held during school terms at the Hutt Art Society. Each term (roughly school terms) there is a theme such as skies, tone, colour theory, still life, water and reflections, something for everyone. I provide all the necessary teaching aids and reference. Beginners are made very welcome. "Colour Design for the Watercolourist" and "Watercolours for Beginners". My method of teaching is a step by step demonstration. I love teaching a mixture of classical theory and technique, science and plenty of painting time. I will take students at any level of ability. For current workshop information please visit WORKSHOPS page.